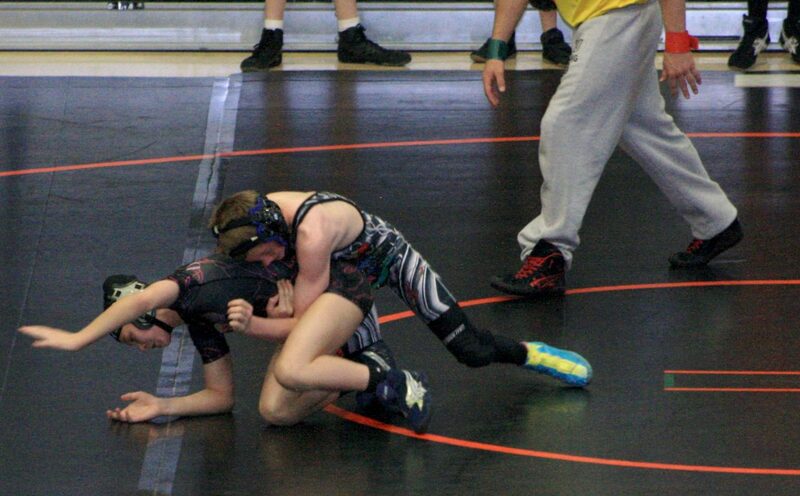 Chris Moschetti competes at the Rocky Mountain Nationals Middle School Region 6 Tournament last weekend in Grand Junction. Moschetti was part of a dominant Craig Middle School wrestling team this season that won three tournaments on the Western Slope. If the middle school wrestling season was any indicator of what’s to come, Moffat County High School’s wrestling team has lots to look forward to. Three Craig Middle School wrestlers are headed to the Rocky Mountain Nationals Colorado Middle School State meet this weekend in Denver for the final competition of the year. But the three of them don’t tell the whole story of what the CMS boys did this season. The Bulldogs went undefeated in the short middle school season on the Western Slope and were dominant. The team started its season with a win in Hayden and followed it up with wins in Steamboat and Soroco. Each time, the Bulldogs won in impressive fashion. The Soroco meet, which doubled as a Western Slope District meet, had seven CMS wrestlers win their weights. In Steamboat, they won by more than 100 points as a team. But while the team had plenty of eighth-grade wrestlers, giving them an advantage against younger wrestlers, work ethic was a major factor in their success, as well. Middle school wrestling has two options at the end of the season, and Craig’s group split up for their regional tournaments. One group went to Meeker to wrestle in the regional there — the final meet of the season — while others chose to take on the Rocky Mountain Nationals regional in Grand Junction for a shot at RMN state. With good wrestlers headed to both tournaments, Craig didn’t dominate across the board as it had for most of the season. But both teams still managed fourth-place finishes with small rosters. In Grand Junction, Miki Klimper won a regional title at 145 pounds, while Drake Zimmerman and Chris Moschetti both qualified for state in third.